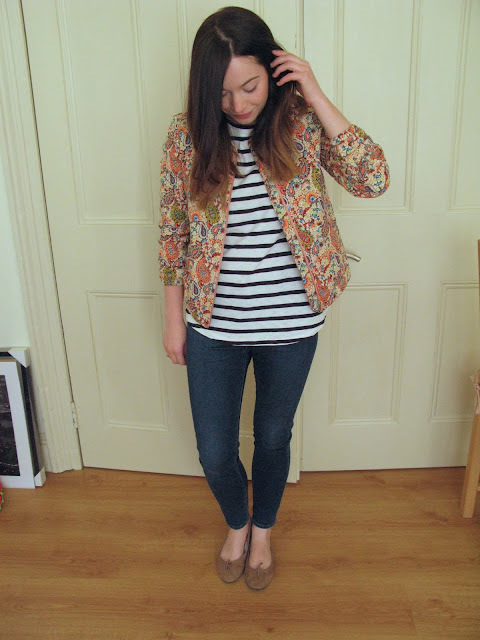 In which I treat stripes as a neutral! Which they are aren't they? I wore this yesterday evening for the jazz night at our local pub. I bought this paisley quilted jacket from Zara a while ago after seeing it on Anneli of What I Bought Today (she wears everything so well it is a challenge not to snap up everything she blogs about!). The stripe top is a JCrew find from when I was in America and is my favourite striped top to date. The little pocket and cut of the hem make it pretty much perfect to my mind. I paired the whole shebang with Topshop Jamie jeans, Russell & Bromley flats, Monica Vinader and Bijoux by Desi F jewellery and Lipstick Queen lipstick in Medieval. I like the jacket combined with the top! And those jeans seriously fit you perfectly. very cute! nautical chic. I really like your photo header of your blog. I like the print and stripes combo!